No more walking for hours to another neighbourhood to queue up at Iya Dun Dun's stall to buy the perfect, crunchy on the outside, moist on the inside fried yam. 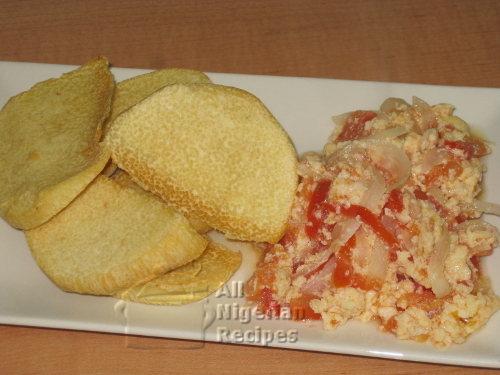 No more serving the uninteresting fried yam every Sunday morning because this page is about frying that perfect yam with "character" in your own home. Always use puna yam for this recipe. Puna yam is white and has a brown bark. For the perfect fried yam, do not use the head of the yam because it is too fibrous and sometimes bitter. Do not use the tail either because it does not contain enough starch and it's kind of tasteless. Reserve those ends for the Beans Porridge and Yam recipe. For the classic taste, always use tasteless and odourless vegetable oils when cooking Nigerian food. 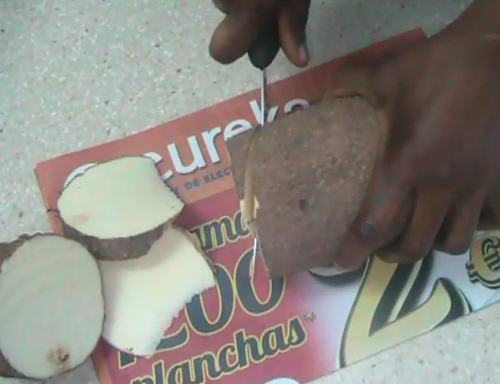 Peel and cut the yam tuber into tapered discs. Rinse the yam cuts and place in a bowl. The number of pieces of yam in a batch must be the quantity you can fry at the same time so this depends on the size of your deep fryer or deep frying pot. Add some water to the bowl. For about 8 pieces of yam, you should add about 3 tablespoons of water. Toss the contents of the bowl to distribute the salt. Pour some vegetable oil in a pot (at least 3 inches deep) and set on the stove to heat up. If you are using a deep fryer, pour enough vegetable oil into the fryer as per the instructions manual and preheat the oil to 190°C. When the oil is very hot, carefully pour the contents of the bowl (water and yam pieces) into the hot oil and cover the pot. This is why it is important that you only put the quantity of yam pieces you can fry in one go into the bowl. Leave it to cook-fry for a few minutes and stir. Be careful when stirring because the oil will be spattering due to the water in the oil. Note: With the water in the yam, the yams will be cooked for a bit before the frying starts. This is what makes the inside of the yam moist. The very hot oil ensures that the yam pieces are crunchy on the outside. Keep stirring from time to time till you can feel the crunchiness when the spoon makes contact with the yam pieces. The tapered end will begin to brown a bit too. When happy, transfer to a paper-lined sieve to drain and that's it!